Banners There are 105 products. Roman style decorative banners. The banners can not be altered in type design. Decorative banners medieval type. The banners can not be altered in type design. 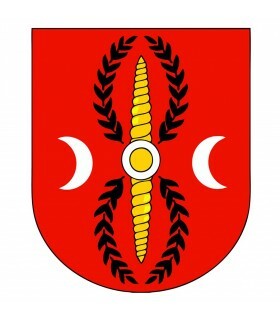 Medieval themed banners, Roman, Greek, Egyptian... The flag is a piece of cloth, usually rectangular attached by one side to a pole, or hung from a halyard. It is used to identify or represent a person or group of persons. In the medieval houses was common to see the banners representing lords, kings or important names. 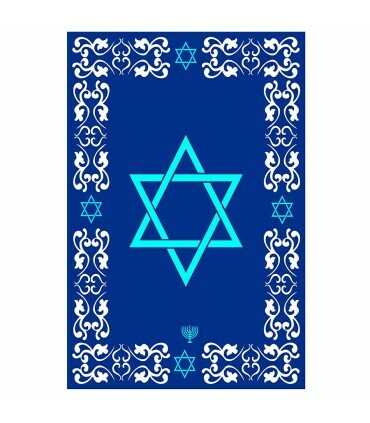 Decorative banners with Jewish designs and motifs. 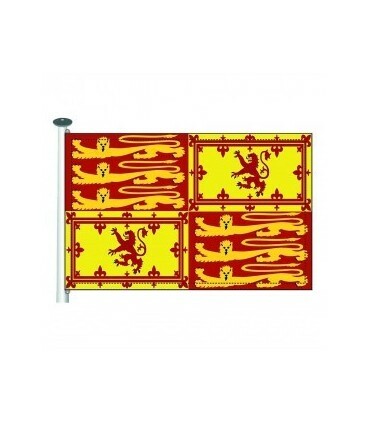 Bicolor Lion Rampant banner available in various sizes. Made of polyester 110 gr. with seams on the ends. It comes prepared with tape and fastening rings. Medieval castle Castle-Fleur de Lis available in various sizes. Made of polyester 110 gr. with seams on the ends. It comes prepared with tape and fastening rings. 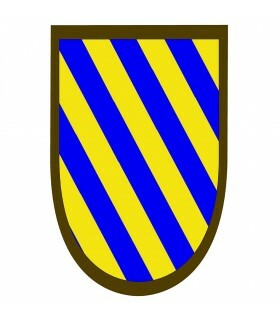 Medieval banner blue-yellow diagonal stripes. Available in various sizes. Made of polyester 110 gr. with seams on the ends. It comes prepared with tape and fastening rings. 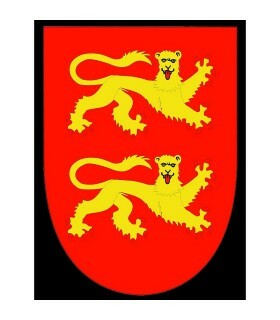 Medieval banner rampant black lion. Available in various sizes. Made of polyester 110 gr. with seams on the ends. It comes prepared with tape and fastening rings. 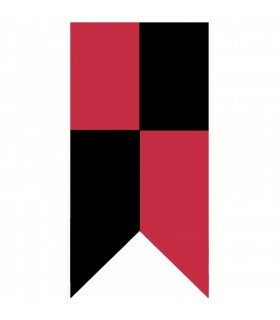 Medieval standard ruined rhombuses. Available in various sizes. Made of polyester 110 gr. with seams on the ends. It comes prepared with tape and fastening rings. 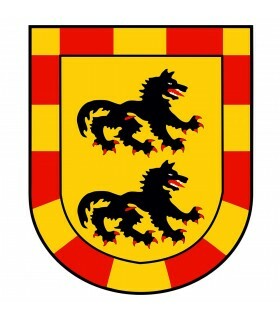 Medieval banner Ricardo Corazón de León. Available in various sizes. Made of polyester 110 gr. with seams on the ends. It comes prepared with tape and fastening rings. Medieval banner blue and white rhombuses. Available in various sizes. Made of polyester 110 gr. with seams on the ends. It comes prepared with tape and fastening rings. Quarterback medieval barrack Ricardo Corazón de León available in several sizes. Made of polyester 110 gr. with seams on the ends. It comes prepared with tape and fastening rings. Medieval standard barracks templar crosses available in various sizes. Made of polyester 110 gr. with seams on the ends. It comes prepared with tape and fastening rings. 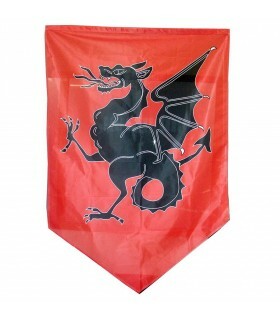 Medieval dragon standard made of 100 gr polyester. with seams on the ends. It comes prepared with tape and fastening rings. 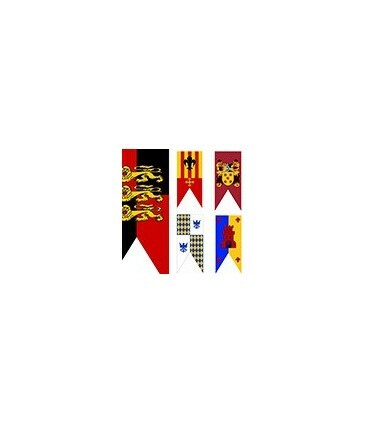 Medieval banner Lanzas-Fleur-de-lis available in various sizes. Made of polyester 110 gr. with seams on the ends. It comes prepared with tape and fastening rings. Banner Bicolor Dragon Rampante available in several sizes. Made of polyester 110 gr. with seams on the ends. It comes prepared with tape and fastening rings. 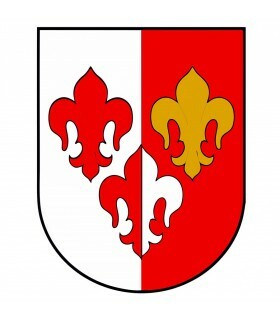 Medieval fleur de lis banner with 2 peaks. Available in various sizes. Made of polyester 110 gr. with seams on the ends. It comes prepared with tape and fastening rings. 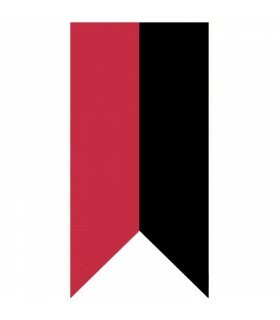 Roman imperial standard available in various sizes. Made of polyester 110 gr. with seams on the ends. It comes prepared with tape and fastening rings. 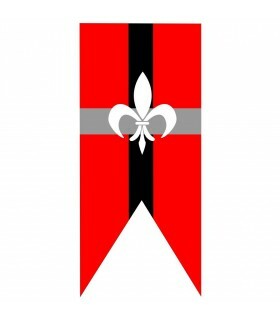 Medieval fleur de lis banner available in various sizes. Made of polyester 110 gr. with seams on the ends. It comes prepared with tape and fastening rings. Medieval yellow dragon standard available in various sizes. Made of polyester 110 gr. with seams on the ends. It comes prepared with tape and fastening rings. 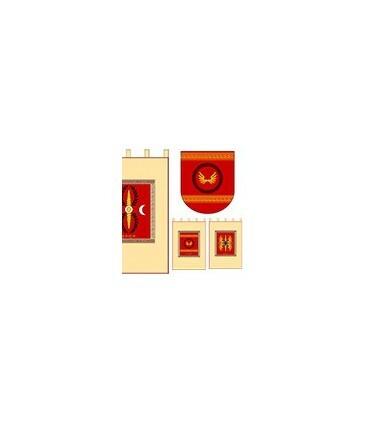 Medieval standard barracks dragons and crosses available in various sizes. Made of polyester 110 gr. with seams on the ends. It comes prepared with tape and fastening rings. 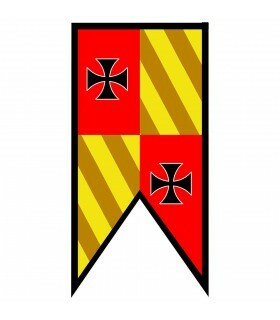 Banner Medieval Quartered peaks Templars Crosses. Made of polyester of 110 gr double-stitched at the ends with threads resistant and ribbon with two rings on the side of the mast. 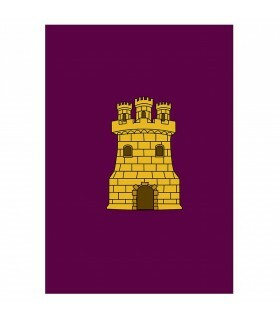 Medieval castle standard for exteriors. Made of polyester with double stitching at the ends. It comes prepared with tape and fastening rings. 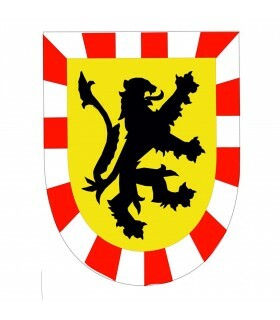 Medieval banner red-white bicolor de lis lis. Made of polyester with double stitching at the ends. It comes prepared with tape and fastening rings. 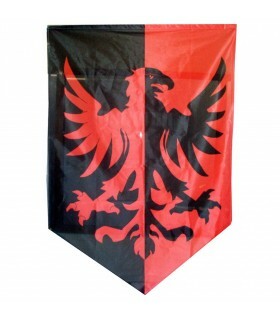 Medieval eagle banner made of 100 gr polyester. with seams on the ends. It comes prepared with tape and fastening rings. Medieval checkerboard-diamond pattern made of 100 gr polyester. with seams on the ends. It comes prepared with tape and fastening rings. 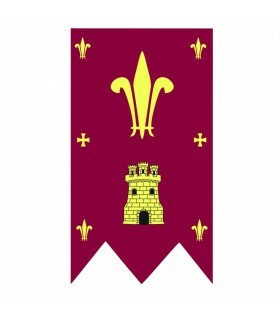 Medieval fleur de lis banner with medieval cross. Made of polyester 110 gr. with seams on the ends. It comes prepared with tape and fastening rings. Medieval standard yellow-black templar crosses available in various sizes. Made of polyester 110 gr. with seams on the ends. It comes prepared with tape and fastening rings. Medieval standard templar crosses with dragons available in various sizes. Made of polyester 110 gr. with seams on the ends. It comes prepared with tape and fastening rings. 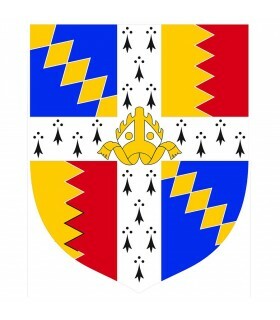 Medieval eagles standard with fleur de lys available in various sizes. Made of polyester 110 gr. with seams on the ends. It comes prepared with tape and fastening rings. Medieval standard shield weapons castles available in various sizes. Made of polyester 110 gr. with seams on the ends. It comes prepared with tape and fastening rings. Banner medieval Quartered Cross of Santiago in several sizes. Manufactured in polyester 110 g with seams at the ends. Come prepared with tape reinforcement and two rings clamping on the side of the mast. 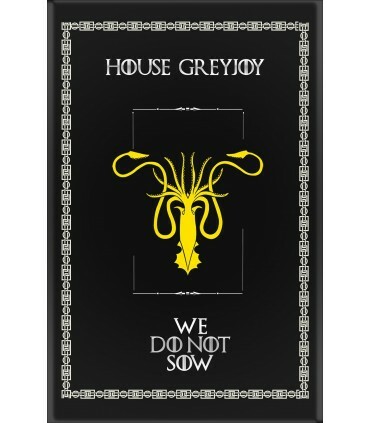 Banner Medieval Dragon 120x100 cms. Manufactured in polyester 110 g with seams at the ends. Comes prepared with double-stitched at the edges, tape reinforcement, and two d-rings for lashing to the mast. 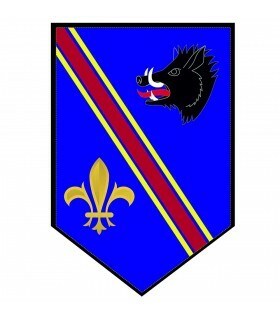 Banner Medieval Boar with fleur-de-lis available in various sizes. Probably constructed belonging to a lineage or family bourgeois medieval. Manufactured in polyester 110 g with seams at the ends. Come prepared with tape and a ring clamp. 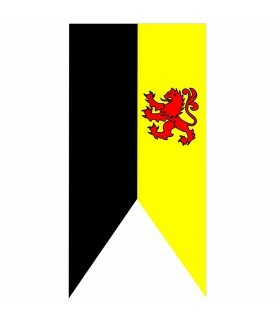 Large medieval Bicolor flag of 120 cms. x 220 cms. Made 100% cotton. It can be machine washed at 30ºC. Available in various colors. 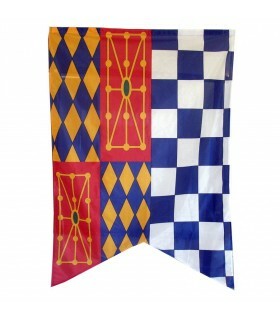 Large medieval standard Barracks 120 cms. x 220 cms. Made 100% cotton. It can be machine washed at 30ºC. Available in various colors. Medieval standard armor made of polyester of 100 gr. with seams on the ends. It comes prepared with tape and fastening rings. 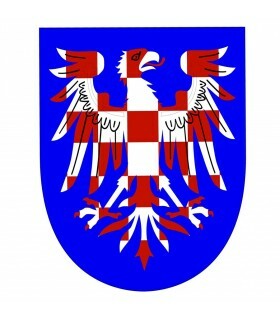 Medieval eagle banner with red-white colors. Available in various sizes. Made of polyester 110 gr. with seams on the ends. It comes prepared with tape and fastening rings. 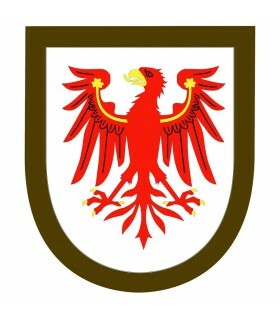 Medieval banner red eagle. Available in various sizes. Made of polyester 110 gr. with seams on the ends. It comes prepared with tape and fastening rings. 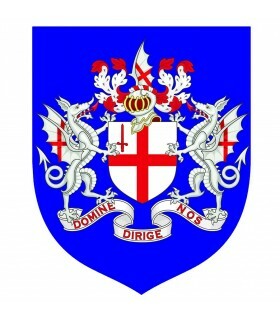 Medieval banner with dragons and coat of arms. Available in various sizes. Made of polyester 110 gr. with seams on the ends. It comes prepared with tape and fastening rings. 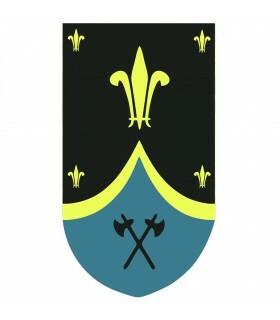 Yellow-green medieval banner. Available in various sizes. Made of polyester 110 gr. with seams on the ends. It comes prepared with tape and fastening rings. 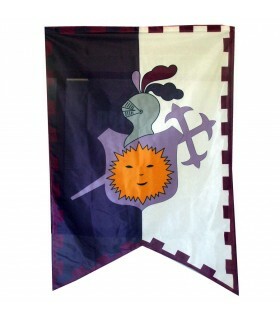 Imperial orange fleur de lys banner available in various sizes. Made of polyester 110 gr. with seams on the ends. It comes prepared with tape and fastening rings. 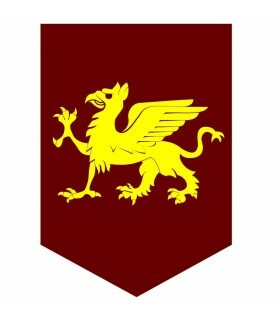 Medieval standard eagles and bars available in various sizes. Made of polyester 110 gr. with seams on the ends. It comes prepared with tape and fastening rings. Medieval banner fleur de lis mosaic available in various sizes. Made of polyester 110 gr. with seams on the ends. It comes prepared with tape and fastening rings.